The Swiss research project DIASTOR for the digitization and restoration of archival film is supported by the Swiss Commission for Technology and Innovation (CTI). 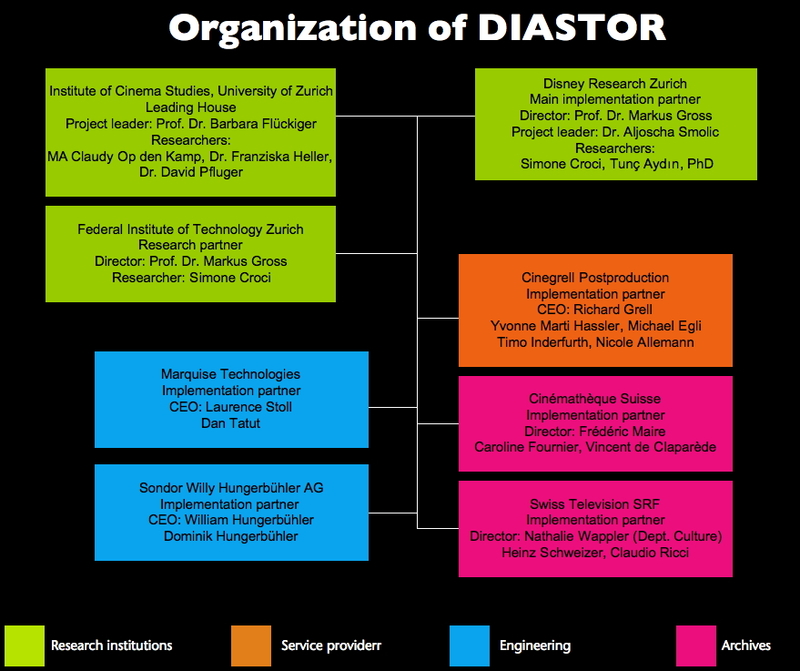 DIASTOR is a cooperation between academic research institutions and the Swiss film industry. It combines film-historical knowledge with restoration ethics, advanced research in IT and technological knowledge of the service providers and engineering companies to offer custom-tailored solutions with the aim to bridge the gap between analog film history and digital technology. Based on our special expertise in historical film colors as published in the comprehensive Timeline of Historical Film Colors we were especially keen to work with historical color material such as Technicolor, Dufaycolor, early applied colors or faded chromogenic stock (Agfacolor, Eastmancolor). Please check out the results page to access information on the research executed within the project (May 2013 to October 2015). Leading house is the Department of Film Studies at the University of Zurich. In collaboration with Disney Research Zurich, the academic partner Computer Graphics Lab of ETH Zürich, the Cinémathèque suisse, SRF Schweizer Radio und Fernsehen, and the companies cinegrell postproduction GmbH, Marquise Technologies and Sondor Willy Hungerbühler AG. Project duration: 2013–2015. See summary and further information on the University of Zurich’s research database.